If you haven’t had the chance to see Commedia Beauregard’s “A Klingon Christmas Carol,” well now is the time. The current incarnation of the show, its fifth, will apparently be the final production in Chicago. Happily, this version is lively, appropriately violent and anchored by a wonderful leading performance from Philip Zimmermann as SQuja’. 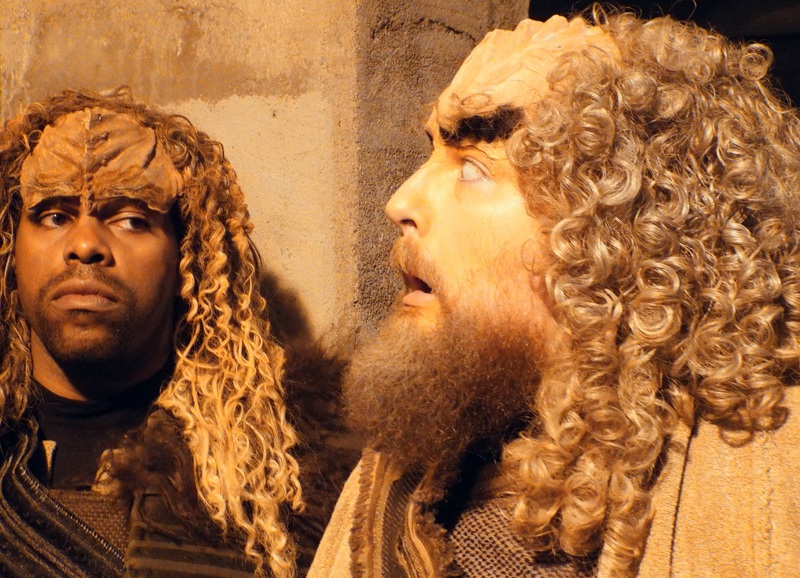 Oh and if you are wondering what exactly “A Klingon Christmas Carol” actually is, it’s… well… it’s a version of “A Christmas Carol” that’s done entirely with Klingons. This year, playwright Christopher Kidder-Mostrom (who co-wrote the piece with Sasha Warren) is on hand to preside over the proceedings. Playing an unnamed Vulcan—a race whose neo-Nimoy mannerisms he has down pat—Kidder-Mostrom welcomes us all to the Vulcan Institute of Cultural Anthropology for a presentation on the marked similarities between Dickens’ “A Christmas Carol” and the Klingon folk story “tInIngam ram nI’ bom” or (“Klingon Long Night’s Song”). The story is then acted out by the Imperial Klingon Players. In Klingon. And when all’s said and done it’s practically identical to the Dickens save for two notable departures: 1.) Scrooge’s miserly penny-pinching and greed is replaced by SQuja’s utter cowardice in the face of battle, and 2.) All normal human (or Terran) interactions have been replaced by fighting, full-on physical hand-to-hand combat. Other than that the two are exactly the same. As the show is performed entirely in a foreign (and, it must be said, entirely made-up) language, the performances often rest upon the physicality, diction and verve of the performers. In this regard, Zimmermann is a fantastic Scrooge. His deep baritone is an ideal vessel for Klingon growls and barks, and he throws around his weight with the solidity and grace of a sumo wrestler. More than anyone else, his performance reminded me of Toshiro Mifune, the star of many Kurosawa and Samurai classics. Zimmermann has a Mifune-like ability to turn posturing into an art. One could almost remove every other actor from the stage and still his face and form could tell the entire story. Commedia Beauregard at the Athenaeum Theatre, 2936 North Southport, (773)935-6875, cbtheatre.org. Through December 21.